This Christmas we remember those in our lives who have lost loved ones and find this to be an especially difficult time of year. We also remember Jody’s donor family, knowing that this year there will be one less person sitting around their Christmas table, and the heartache that must cause them. This year we bought a special ornament to hang on our tree in honor of his donor. 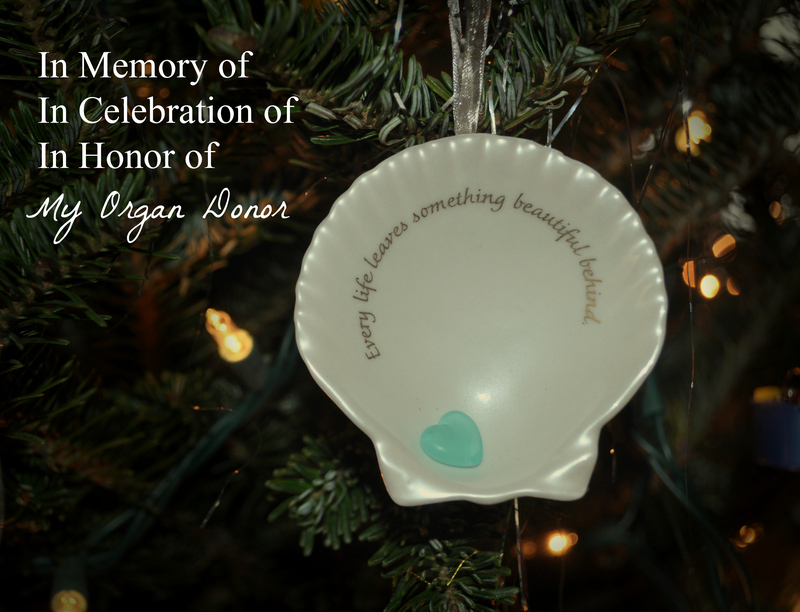 The words of this ornament couldn’t be more true as his donor left behind life… for Jody… and for other organ recipients. We’re so thankful to God, his donor, and donor family for this great gift. 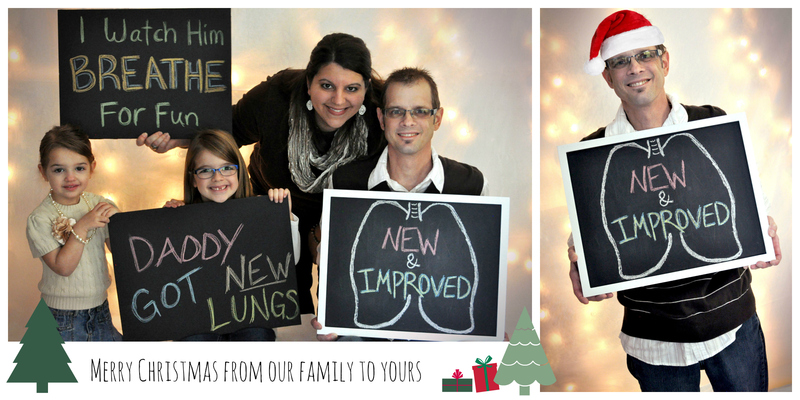 Our gift to them is that we will live life, protect Jody’s lungs, and most of all… never forget. Wednesday we traveled back to Hopkins for Jody’s first post-transplant visit in the Transplant Clinic. For now this will be a weekly occurrence with the goal to gradually increase the space between appointments. As I mentioned in my last post Jody’s first week at home was a rather miserable one as he dealt with painful abdominal cramps and bloating which made eating difficult. These symptoms were the result of a bowel obstruction. There were so many possible causes for this: Narcotics, dehydration (for so much of his hospitalization he was on severe fluid restrictions, both oral and IV), too many CF enzymes (since he has lost so much weight-now down to 105 lbs, his enzyme requirements are less), and CFer’s in general are prone to obstructions (although it’s never been an issue with Jody in the past). There are other possible causes as well. At this point we didn’t care so much about the cause as we did getting it fixed. For two nights Jody did GoLytely, a type of bowel prep that is often used prior to a colonoscopy to clean out a persons system, so to speak. When this failed to work we knew he needed something more invasive. A barium enema was added as first on our list of things to do on Wednesday. This basically includes filling the colon with a special liquid (barium) so that it becomes visible on x-ray. A blockage can then be identified and hopefully broken up. Jody was definitely obstructed but thankfully the procedure worked to fix it. Immediately after the procedure we went to eat lunch and he ate more than he had all week and the best part was that he didn’t have that painful cramping in his abdomen as a result. He’s been eating and pooping ever since, and it’s great to see him feeling better. Hopefully this (obstruction) won’t be an ongoing issue that he has to deal with going forward. The rest of our day long but was rather uneventful. 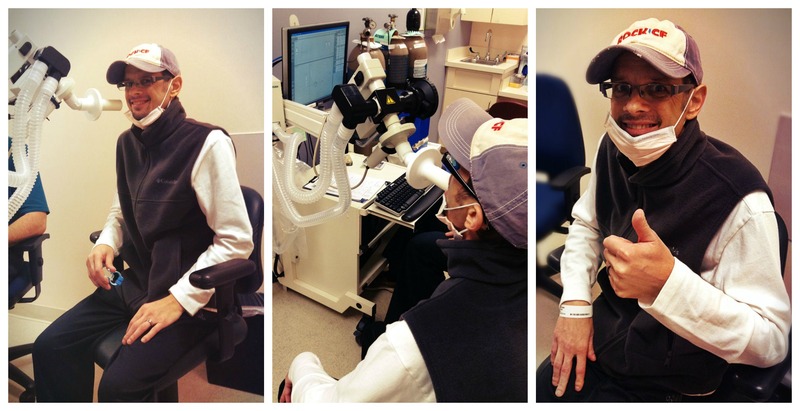 Jody had a chest x-ray and then his first post-transplant hopsital PFT’s (pulmonary function testing). He now has a machine at home to check these twice a day and we were anxious to see how the home machine correlates with the hospital machine. The numbers were surprisingly close. His lung function this day was 64%!!! When we left the hospital a week prior he was at 50%. This number is expected to continue climbing and we’re told usually peaks between 6-12 months post transplant. I still can’t believe how easy Jody makes this testing look compared to a few short weeks ago. Even the tech who performed the test commented on how neat it was to see him walking in there, no oxygen, and able to do the test so effortlessly. Can you imagine how ‘easy’ it will be for him as his lung function increases? I’m so in love with these new lungs of his! In clinic we met with Jody’s transplant coordinator and the doctor. Jody’s primary transplant doctor also happens to be a CF doctor (one of the few who works both CF & transplant) so it’s been neat to see him through the years as one of Jody’s primary CF docs and now his primary transplant doc. 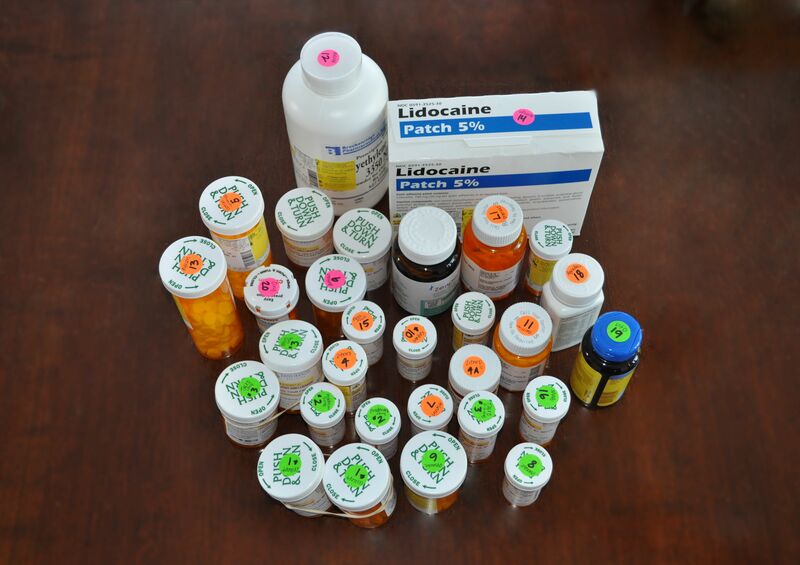 At his appointment we reviewed his extensive medication list and made some changes. We reviewed all the home self-monitoring data we’ve been recording (vital signs, weight, PFT’s). They checked out his incision and all the healing sites where tubes and lines were removed. Dr. M listened to his lungs, smiled and said, “You’re lungs sound SO good!” Those words seem so foreign after years and years of unclear lung sounds. It’s music to our ears. Jody’s x-ray did show that he still has inflammation and fluid in his lungs (we knew this when we left the hospital) so hopefully this will resolve on its own. Jody’s been having a hard time sleeping at night because he needs to stay at a 30% angle. He has pillows propping him up so that his shoulders stay upright but it makes it hard to change positions at night. It’s also hard for him because he is not normally a back sleeper. He wakes up with back and neck aches. Some nights he even sleeps half of the night in bed and the other half on the couch. I never quite know where he’s going to be when I wake up. Jody talked to the doctor about this in clinic but they hold firm to the fact that he needs to sleep upright to prevent another aspiration episode (even though he doesn’t eat for over three hours before bed). I’m going to order Jody a wedge pillow I found online to see if that helps. Jody has thought about buying a recliner chair but that doesn’t seem like a reasonable long-term solution; we’re too young to sleep in separate chairs beds. If this is a lifelong thing we may need to break-down at some point and order one of those mattresses that sits up. For now I hope the wedge pillow will work, obviously that’s the easiest and cheapest solution. The last two days have been much better than all the previous days at home. It’s been great to see Jody eating again and not paying for it afterwards. Speaking of food, many of you have asked how you can help, and here is one way you can bless us. Our friend Kendra has kindly set up an online meal schedule for us. Meals are so wonderful, especially for me, so I don’t have to worry about cooking in addition to taking care of Jody and our girls. When I go back to work I know they will be even more helpful. If you are interested in bringing us a meal you can CLICK HERE to sign-up online. Thank you to those of you who have already signed-up or brought a meal, you don’t realize how helpful this is to us, and we are so very grateful. At discharge we sat down with a pharmacist and Jody’s transplant coordinator to review his meds and fill his first pill box. We were given an eight page chart full of medications to guide us with what to take and when to take it. This first week I gave Jody a ‘free pass’ and I took responsibility for giving him all of his meds at the appropriate time. Next week we will do it together and the third week he will do it by himself while I watch. I learned a few things this past week, one being that the pill box provided by the hospital was not working (at least for me). There were not enough slots in a day to accommodate the numerous times he needs to take meds. For instance, all morning meds were lumped into one slot even though they are taken at different times throughout the morning. After an unsuccessful Google search for a six-slot per day (or more) pill organizer, I decided to get creative and make my own. 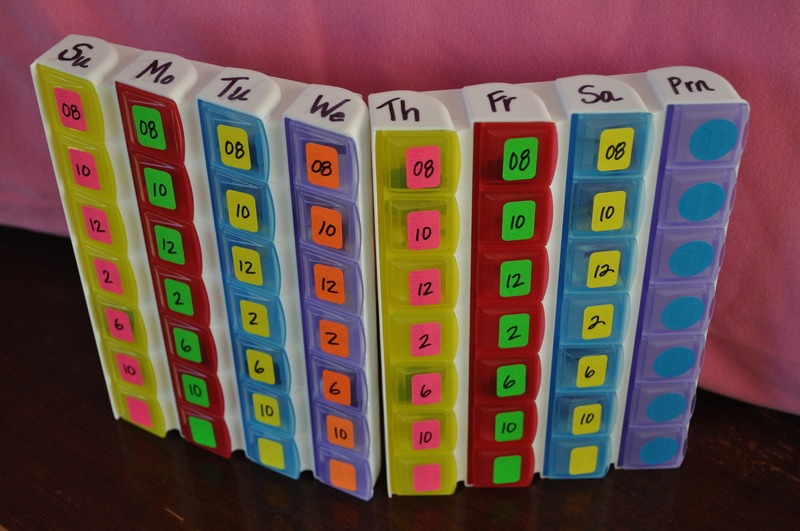 I bought two seven-day pill boxes with four slots for each day. I flipped the boxes on their side to make the seven-days become seven-slots (per day). Now I can label the specific time Jody needs to take his meds and I even have an extra section for PRN (as needed) drugs or Jody’s digestive enzymes. I realize that pill boxes are not exciting reading material so please know the only reason I share this with you is because there are a number of pre and post transplant readers of my blog who might find this method helpful for them as well. In addition to medications, Jody also needs to check his blood sugar four times a day and often requires insulin coverage (he will most likely develop full-blown diabetes as a side effect of some of the medication he is taking for his lungs). One thing that is odd about this is that because of his Cystic Fibrosis, which still affects his GI system, he doesn’t need to limit his sugar/carbohydrate intake. As a result, he can eat things most diabetics would need to avoid, although it does cause his blood glucose levels to rise significantly. It’s hard for me to understand this balance or lack thereof. On the day of discharge Jody had swallowing study #5 done. If you remember, the week before he was given permission to eat again, but wasn’t allowed to drink thin liquids. At this test they did clear him to drink regular liquids but he must tuck his chin down to his chest to swallow. He is still experiencing laryngeal penetration where the liquids go down into the larynx and are stopped by the vocal cords from entering into the lungs. He was given a special cup to use for liquids because it only allows him to take in 10 mL of fluid per sip. I lovingly refer to this cup as his ‘adult sippy cup’ because that’s just how it looks. This cup prevents him from taking in large volumes which would most likely make their way past the vocal cords at some point. After everything we’ve been through another aspiration episode is the last thing we need. Jody also can’t eat foods that are mixed with liquids such as cereal or soup, like vegetable. Additionally, to prevent aspiration he needs to sleep at a 30 degree or more angle. Propping pillows and not being able to change positions at night has been difficult and uncomfortable for Jody. He is waking up with back pain as a result. We’ve heard mixed talk about the follow-up plan regarding his swallowing issues. He might need speech therapy to give him exercises to strengthen his swallowing muscles or they might just wait and repeat another swallowing test (yes, #6!) after he’s been eating on his own (which could in itself fix the problem). For right now Jody is really glad to be able to drink again, even if it is just 10cc’s at a time. At this time Jody is not allowed to be left alone. Because he is immunosuppressed, and we are in cold and flu season, we continue to be careful about germs and exposing him to outside people. It’s hard to know when and how to let up on this. As far as I am concerned, for the first time in five weeks I am mask-free! This is both liberating and terrifying at the same time. I often wonder if I will ever kiss him without fear of killing him by spreading some bug I may not know I have. I realize everything is quite fresh right now and that I will probably relax about it in due time, but for now the fear of germs and bugs is still very real. I wish I could say we’ve been living it up here at home and having the time of our lives, but it simply wouldn’t be true. While the routine is going fine, Jody has not been feeling well. He has spent much of the week sleeping and is having a lot of intermittent yet intense abdominal pain. Eating makes the cramping and bloated feeling worse, not eating is causing him to lose weight that he shouldn’t be losing. It’s hard to encourage him to eat, knowing the pain it will cause him, yet its hard to see the skin hanging off his body knowing it will only get worse if he doesn’t eat. It wouldn’t surprise me if they start using his feeding tube again for extra nutrition but Jody is strongly against this. Bowel obstruction could be the cause of all the abdominal pain Jody is experiencing. Today the doctors called in a prescription for him to do a colonoscopy-type bowel prep that should clean out his system completely. Tonight he is feeling a little better but he also hasn’t eaten so it’s hard to say if the clean-out worked or if its his empty stomach that has him feeling a little better. This has been an ongoing issue for Jody and it is very frustrating and overwhelming for him. He has had moments where he sincerely wondered if all of this (transplant) was even worth it. I know that deep down he knows it was, and that he will get better, but we (you and I) can’t belittle how hard this major surgery was on him (and anyone else going through it). It’s so much easier for me to say, “Of course it was worth it!! !” because I’m not the one experiencing it first hand. For this reason I chose to stay quiet, but it didn’t keep me from shouting those words in my head. I know that in his heart Jody knows transplant was worth it; he’s got a wife and two little girls to live for and to watch grow into young ladies. Speaking of little ladies. On Tuesday our family of four will finally be back together. Our youngest daughter had a recent live vaccine so she wasn’t allowed to be in the same house as Jody for a two-week period afterwards. It turned out to be a smooth transition to home only having the oldest with us because she is in school for eight hours a day, and is also a little more independent. I’m excited to have everyone at home under one roof, but I’m not gonna lie, I’m a little nervous about it too. Please pray that God would give me an extra dose of patience and that things would go smoothly. We will be heading back to Hopkins for transplant clinic on Wednesday. This will be a weekly thing for the time being but the visits will gradually be spaced further apart. Hopefully by this weeks appointment Jody will feel better and won’t need to stay; that possibility is never very far off. Please continue to pray for Jody’s ongoing recovery and especially for the GI issues he’s been having. Your words of encouragement do wonders for the soul. It is so touching to know that people (still) care and so I hope you will take the time to continue uplifting Jody with your words/comments. Until next time… thank you for reading. Our Jody Needs Lungs benefit auction is over and what a day it was! We couldn’t be at the event since Jody was just transferring out of the ICU, but we heard from people that it was a great time! Below is Jamie, our friend and auction planner (standing 10th in from the right), along with her the team of volunteers who made this day possible. 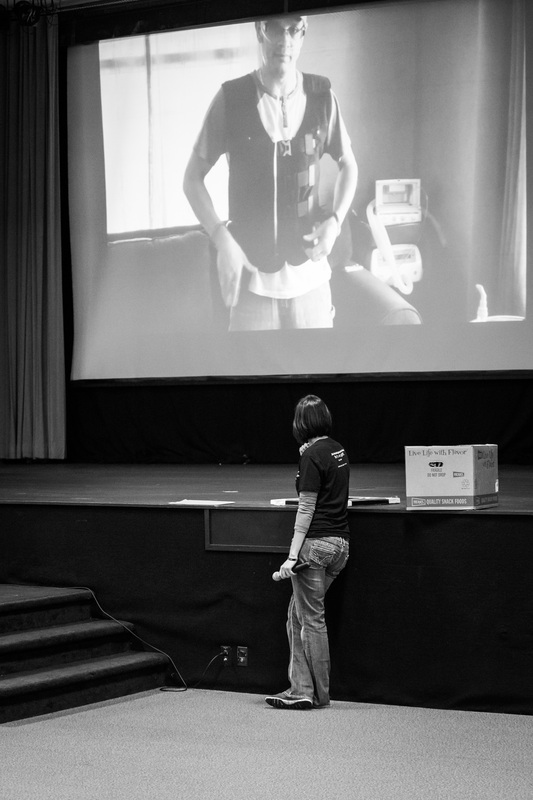 If you were one of those volunteers and are reading this post… thank YOU! You helped to make this day run smoothly and successfully and we appreciate that you were willing to give up your precious time on our behalf. Since we couldn’t be at the auction, John Martin of John Martin Photography, kindly volunteered to photograph the event for us. It was great to know we could count on him to be our ‘eyes’ at the event. We loved seeing the pictures he took and thought we’d share them with you. Rather than going into details about the event, we’ll let the pictures do all the talking. To view the online gallery, click below. Thanks again John, for giving us this gift. When planning this event we decided on having a photo booth since they are all the rage right now. Jamie came up with a fun way to combine photo booth silliness with encouragement for Jody by asking attenders to write supportive messages on a chalk board frame when they had their pictures taken. Robert Buzzard of Robert Buzzard Photography willingly agreed to help us out with this activity and he has provided the link below for you to see the fun for yourselves. Thank you Robert for supporting us by donating this activity at the auction, Jody was encouraged by all the messages. About a month before Jody’s transplant he and I created a short video that could be shared at the auction. While it’s far from perfect we were proud of how it came out and thought we’d share it with you. This video was shown just before the live auction began. We hope it creates awareness of Cystic Fibrosis, a disease which frustratingly, few people know much about, and one that is near and dear to our hearts (you might not be able to view this video from email, but will probably need to go to the blog site itself). Having said that, thank you, thank you, thank you to each and every one of you who had a part in making our benefit auction a success. Whether it was in planning, prepping, getting or giving donations, picking up items, sharing the event, volunteering on the day of the event, purchasing items at the auction, YOU MADE IT POSSIBLE!!! Together you added $13, 078 to our transplant fund! This figure does not even include the money raised from selling t-shirts at the auction, which we hear were a big hit (on a side note, we have a few shirts left if you are interested in purchasing one leave a comment). We couldn’t be more pleased with the outcome of this event. Now that the auction is over, we want to tell you again how much it means to us to have your emotional, practical, prayer, and financial support. Already, this transplant has been expensive (food, outrageous parking fees, fees for use of the room TV, purchasing medical equipment for home, missed work, etc). and we haven’t even left the hospital yet. 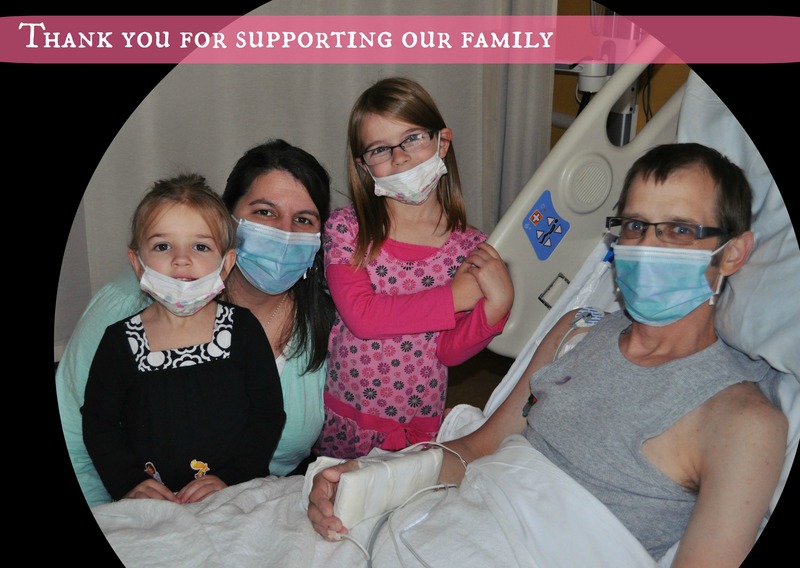 Your financial support has given us so much peace of mind as we face these costs as well as the hospital bill and medication and doctors expenses throughout this first year post-transplant. From the bottom of our ‘healthy’ lungs, THANK YOU for your support! I think a new, updated blog post is in order, how about you? Jody was transferred out of the ICU Thursday night (Oct. 9th) as we anticipated. He is back on the cardiovascular progressive care unit, where he was before, and it feels like coming home. How we missed this place and the nurses, during his week in the ICU. From a breathing stand-point Jody continues to improve. Since his transfer he has been off oxygen at rest and his O2 sats have improved, ranging 95-98%. His shortness of breath with activity is much improved as well. He is able to walk to the bathroom now without much difficulty. Last week, even just moving in bed or sitting on the side of the bed elicited shortness of breath like I’ve never seen. One time in the ICU I saw his O2 sat drop as low as 55% (with good waveform for my fellow nurses), and they consistently dropped into the 60’s with activity. Yesterday, while walking in the hallway, he still looked and felt short of breath but nothing like the week before. His oxygen saturation only dropped into the 80’s. It seems the change in antibiotics are doing the trick to knock this bug out of him, and we’re so glad. Even his chest x-ray is showing signs of this improvement. 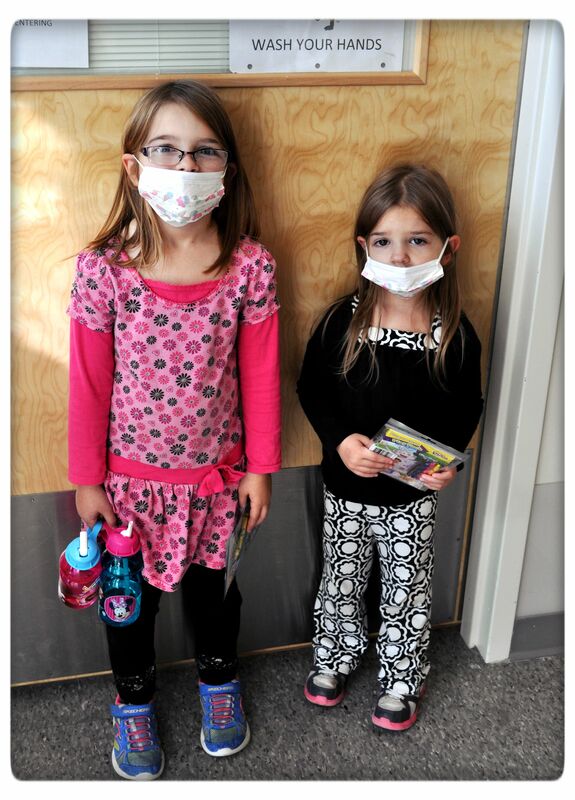 While breathing is much improved, this infection certainly took its toll on Jody. 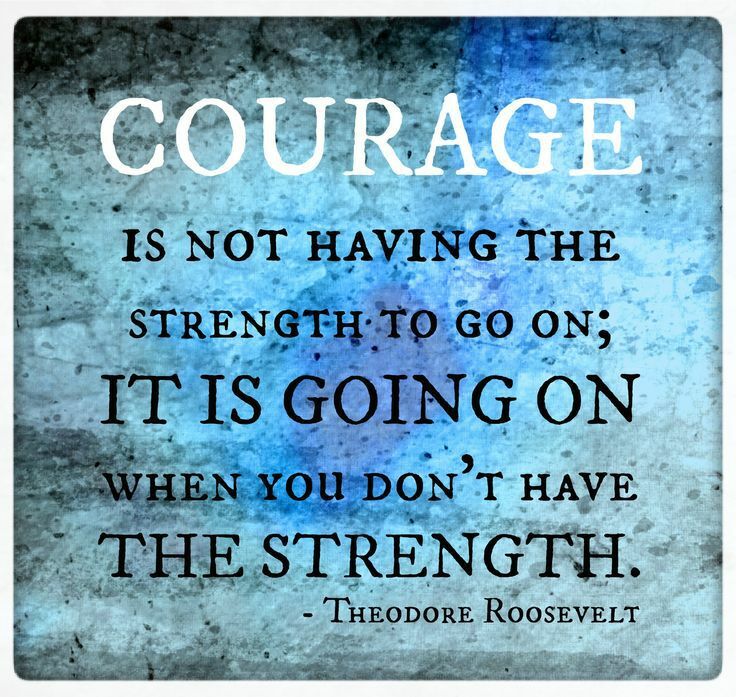 I am amazed at how much strength can be lost, even for a ‘healthy’ young man, after just one week of inactivity. It seems Jody has lost a lot of muscle tone and conditioning. Walking is harder than it’s ever been. On Saturday he walked about 150 feet and could go no further. 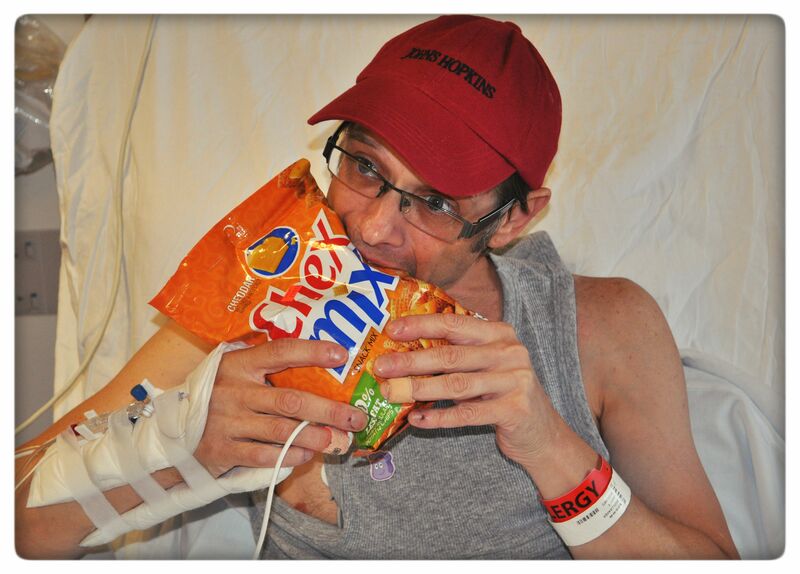 On Sunday he walked one lap around the nursing unit (400 feet), taking three breaks to complete it. He looks quite wobbly on his feet. He will need to work with physical therapy to gain back that which was lost. As you know, Jody has been NPO (nothing by mouth) since Thursday, October 2nd. Actually, he has only eaten six days of the four weeks he has been here. He has been getting nourishment through his feeding tube for some of this time, but the effectiveness of it is unknown. Literally, this feeding is going right through him, even waking him up six or more times a night to use the bathroom. The doctors adjusted his enzymes to help his body better absorb the nutrients, and eventually switched him to a different formula, which did help a little. On Saturday Jody started to complain of feeling bloated. They hooked his feeding tube up to suction and it appeared the tube feeding was being suctioned out of his stomach. If you remember from a previous post, Jody has two parts to his feeding tube. The meds, and only meds, go into his stomach, and the feeding goes below his stomach into his small intestine. There should be no feeding in his stomach because the doctors don’t want it refluxing up into his lungs. This is why it was odd that when hooked up to suction, tube feeding appeared to be coming from his stomach. The NP ordered an abdominal x-ray and sure enough, the “J” portion of his feeding tube, which should be in his jejunum, or small intestine, was instead in his stomach. Tube feedings were stopped all together and Jody will need to have this repaired under endoscopy tomorrow. Last night they restarted him on IV nutrition (which is said to be less effective, but something nonetheless). With everything going on in the last four weeks, and only six days of real food, Jody has lost about 20 lbs. This morning he weighed in at 113 lbs! This was a difficult weekend for Jody. He felt exhausted, tired of all of this, and just plain down in the dumps. At one point he looked at himself in the mirror, seeing the effects of his 20 pound weight loss (which he didn’t have to lose in the first place), and had a break-down. He missed our girls, he wanted to eat, he wanted to feel better and strong again, and he wanted to be home. Truly I can’t imagine what it’s like to be in his shoes. I see the weight loss, I see how de-conditioned he is, I want him to be home again too, but I kept that to myself and listened and encouraged him. Now that his breathing is improved I believe those other things will follow suit. He’s breathing well (for the most part), something he hasn’t done for over a year, so what’s it matter if he’s skin and bones for a short period of time? Pretty soon he’ll start putting weight on, exercising, and he’ll have his strength back. “Look out Arnold (Schwarzenegger),” he says! I am so happy to tell you that Jody’s hallucinations, constant crazy talk in his sleep, and tremors are gone! His vision is also much improved! It has been one week since the doctors took him off the Voriconazole, and they told us it could take 5-6 days for it to leave his system and the symptoms to go away. He was doing and saying some crazy things so it’s wonderful to have him in his right mind again. I hated talking to him like he was a child, and him thinking I was making things up. I’m so glad to have Jody be Jody again. I believe he is now getting better rest since his mind is relaxed (and the fact that he’s not running to the bathroom all night anymore either). Yesterday afternoon our girls came for a visit. One of the NP’s in the ICU actually suggested it as a way to boost Jody’s spirits. It had been four weeks since they saw each other. Jody choked up when they first walked in, watched them a little and then went to sleep. He mostly slept through the visit, but it was good for them to see him and know where he is at and that he is okay. Naturally, we took a family picture before we said our goodbyes. This morning Jody woke up looking better than he has in a while. We had been looking forward to this day as the day he would undergo his fourth swallowing test and possibly be allowed to eat again. He left for the test this morning around 10 am. Since aspiration might have played a role in what caused Jody’s lung infection, they tested him more extensively this time. Thank goodness he passed!!! I knew it would not be good for him (in more ways than one) if he failed, but thankfully he didn’t. Dr. Shah is allowing him a regular diet but he will need honey-thickened liquids (liquids made to the consistency of honey). Like the muscles throughout his body, his swallowing muscles are also weakened. After a few days of eating again this should improve. He will most likely need one more swallowing eval before they will let him drink un-thickened liquid. This will mark Cine (swallowing test) #5! He’s going to be a pro at these by the time he leaves here. Those of you who know Jody well know that he’s a big iced tea drinker. I’m wondering what he’s going to think of drinking iced tea with the consistency of honey? Perhaps he’ll be so happy to eat that the thickened liquids won’t bother him. It seems things are looking up. Please pray that no new damage is done when Jody starts eating again (I’m feeling a little paranoid about this considering all we’ve been through), and that progress and healing continue. We are so ready for the sweet life that these new lungs can and will bring us. Praise God we are finally seeing some progress again! Jody’s biopsy on Tuesday showed unspecific diffuse alveolar damage (basically lung injury), but no rejection! We were happy to hear this news. In the last two days Jody has made huge progress, particularly in his breathing. I’m quite shocked at the difference of a few days. Today he was on 0-1 liters of oxygen at rest, and tolerated that well, keeping his O2 sats 88 or above. He does still need the increased oxygen concentration for walking (50%), but even with that his sats are not dropping nearly as much as they were previously in the week. I can’t tell you how great it is to see this change. It was miserable watching him so, so short of breath. There were about two days this past week when Jody felt like giving up. Thanks to the prayers of many, calls from friends to encourage him (even at one o’clock in the morning when he needed it), his inner strength, love for his little girls, and ultimately, The Lord, he was able to pull through. His transplant recovery is far from over, and we’ve learned that things can change very quickly, but we are celebrating his turn-around. Today when he was out walking in the hall it seemed like all the staff in this busy ICU stopped to smile and comment on his progress. Their cheering was genuine and it encouraged Jody to strut his stuff all the more. They’ll be calling him ‘speed walker’ again in no time. Now that we know the issues Jody has been having are not the result of rejection, there are mixed opinions on the actual cause of this set-back. Theory #1 is aspiration. Jody drinks a 16 oz. weight gaining shake before bed, he’s done this for as long as I have known him. When he was granted permission to start eating again he began drinking his shakes just before bed as usual. After that he laid down flat (or near to it), and went to sleep. None of us (myself or the nurses) gave it much thought. The thought behind this theory is that his shakes refluxed up his esophagus and back down into his lungs without him ever knowing it happened. This is why they call it silent aspiration and is the result of the damage done to his nerves during surgery. Aspiration then leads to infection. 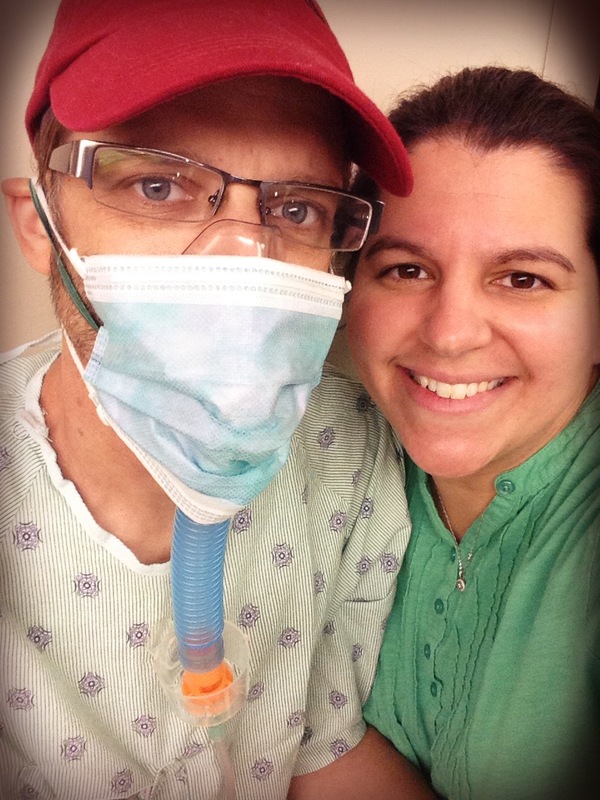 Infection wrecked havoc on Jody’s new lungs. Theory #2 is that Jody’s downfall was solely the result of infection (no aspiration whatsoever). The reason some doctors hold this opinion is because of the damage done to both of his lungs. If aspiration was the root cause, some say the damage would have been primarily in his right lung instead of both. CFer’s (people with Cystic Fibrosis), especially in end stage, harbor bacteria in their lungs chronically. When that bacteria flares up they typically feel sick and need to be hospitalized, as Jody has been many times in the last few years. It could be that some of the old bacteria got into his lungs during the surgery itself (although I believe they do a cavity washing to prevent this). Another possible source of transmission could be from Jody’s sinuses which might harbor some of the bacteria of his old CF lungs. Of course it could also be something he picked up elsewhere which is easy to do when so immunocompromised. Whatever caused the infection that wrecked Jody’s new lungs, we’ll never know. At this point the important thing to focus on is that they’re getting better. His chest x-ray is looking better when compared to a week ago, and his breathing is much improved as well. He’s still not back to where he was before this bug hit him but that will come, slowly but surely. It’s possible that Jody might even be transferred out of the ICU tomorrow, which we’re really excited about. We’re so glad to see Jody’s lungs improving but he still has some other bothersome issues that we’re waiting to see improve as well; twitches and hallucinations. The doctors are looking into medications to help with these effects. Yesterday they did finally take him off Voriconazole, the med they felt was causing the above issues (switched him to something else), and said it might take 4-5 days for this med to clear his system completely. I hope they are right because I know it frustrates Jody to not always know the difference between what is reality and what is not. I feel bad that he is experiencing this but I’ve had plenty of inward laughs about some of the things he’s been saying. Just now, as I type he was picking at his pulse ox probe and talking about the “red mat cardboard that’s underneath it.” Next came the milk he was “drinking upside down.” It seems he never gets a break from the visions in his head. It must be horrible to feel like you’re going crazy but I know that he will laugh at this one day when I tell him stories of things he said and did. One final note about the above medication change is that since the Vori was stopped yesterday Jody reported his vision was slightly improved today. Hopefully this will only get better and better as the drug leaves his body. The lack of food and drink is also starting to wear on Jody. It might be another week before they allow him to have another swallowing evaluation. Pray that he can make it that long on ice chips alone. Progress is being made at last. Here’s to hoping it continues, and we take more steps forward than back. Jody is still hanging out in the ICU and not much has changed since my last post. Breathing continues to be a struggle and is the top concern of the doctors. As anticipated by the infectious disease doctors the bacteria in Jody’s lungs has been identified as a resistant strain of Stenotrophomonas. By resistant I mean that this bacteria is hard to treat because many of the available antibiotics do not knock it out. The good news is that because this is the bacteria we were expecting to find, he was switched days ago to antibiotics they feel will actually treat it. Unfortunately, Jody’s immune system is completely shot (to prevent his body from attacking his new lungs), so fighting this infection may not be an easy thing. Now for some bad news, he’s not getting better. It seems Dr. Shah isn’t so sure aspiration and/or infection are the complete cause anymore. If it were either of those, one would expect to have started seeing small improvements by now, and we have not. Today they are going to do a biopsy of his lungs to check for rejection. Dr. Shah doesn’t seem convinced that this is what’s going on either. We are then left with the burning question…what is it? No one really knows what it is that’s got Jody’s new lungs so beat up. We desperately need an answer so the doctors can figure out how to fix it. The results of the biopsy will take a few days to come back so we won’t know until then if rejection is the issue. After 21 days, the thorn in Jody’s flesh, his left chest tube, will most likely be removed today (after the biopsy). For so long we talked about the celebration we would have when that final tube was pulled, and I’m kind of sad that Jody is a little too sick and a little too delirious to join me in the celebration. He certainly will not miss the pain this tube causes, his shorts getting drenched from it leaking, or the skin tears from the bandages which cover the insertion site. Jody’s tube is still draining a decent amount of fluid but there is a theory that the presence of a chest tube in the body may actually produce more fluid. They hope once the final chest tube is gone his body will stop making so much fluid and will absorb that which is left. I hope they are right and that he won’t need a tube to be re-inserted. I’ve been working on this post in between interruptions all morning. One positive change to report is that I got the approval for Jody to have one ice chip per hour instead of every two or three hours. He can have 24 big, fat ice chips a day! The doctor also approved him for hard candy. If he can stay awake long enough to eat it, I think this will be helpful. I also got an order for Jody to get some medication at night to help with his hallucinations so he will hopefully be able to get better sleep. At this point it would be too detrimental to his lungs to stop the medication causing these effects (Voriconazole) so hopefully the addition of this new med will help lessen those effects. The transplant pulmonary team stopped by a little bit ago. They seem encouraged that while he hasn’t gotten much better he hasn’t gotten worse either. I’m thankful for this but I’m ready for some signs of progress and Jody is too. For now we cling to the fact that he hasn’t gotten worse and we look forward to the day I can tell you he’s actually gotten better.